Gangs! From the hard-hitting Contenders to Invisible, Inc., and the Golden Age Crime League to the sinister Shadow Academy, different gangs of villains to challenge a whole team of heroes. Genres! 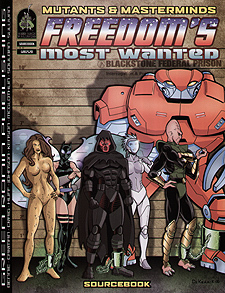 Freedom's Most Wanted includes villains from the Golden, Silver, and Iron Ages of Freedom City, usable with different settings and styles. Whatever your game, you'll find something to suit. Capers! Each villain comes with different adventure ideas, for well over a hundred possible adventures! From petty crooks to world-spanning conquerors, Freedom's Most Wanted has more than enough to keep your heroes busy and Freedom City's prisons full... at least until those bad guys escape to plot anew.